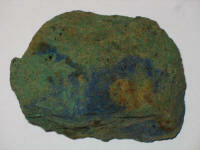 Cu3(CO3)2 (OH)2 Found with the malachite, azurite is bright blue (especially when damp) and is formed in a similar way to malachite. 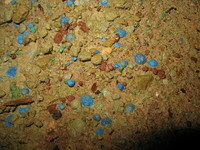 Azurite is less common than malachite but is found in one unusual form in Engine Vein where small spherules, about 3 mm in diameter are found dispersed in a grey clay. 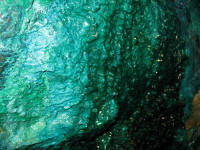 CuSiO3.nH2O Chrysocolla is also a secondary mineral and forms in abandoned mine passages from trickling water. It is a beautiful deep blue-green colour when damp and forms the "Green Waterfalls" in Wood Mine and the "Green River" in West Mine. GALENA Lead sulphide -- PbS Pure galena is shiny grey and looks like lead metal. 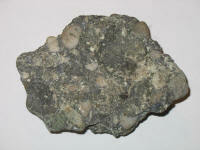 At Alderley it is more often dispersed in the sandstone as grey specks (as in this picture) although the characteristic cubic crystals can still be seen under the naked eye. 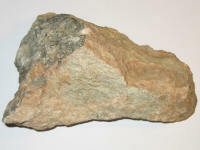 The carbonate of lead, cerussite, is also found abundantly at Alderley. ASBOLITE Complex of manganese/cobalt oxides and arsenates Black and found in small patches in several places in the mines. More strictly known as "Cobaltian Wad", asbolite was worked for a short time to obtain cobalt for blue colouring in glass, pottery and paper. BaSO4 Barite is found very widely on the Edge and has never been worked for profit. In many places it cements the sand producing the very hard rock that stands out at locations such as Stormy Point. Although barite is naturally white, it is often tinted pink by the presence of iron. Barite is often associated with galena as in the picture to the right. IRON Various iron oxides A number of different iron compounds are present which give rise to the distinctive rust-red bands in all the mines. A pale greenish yellow tinge is also seen which is due to different types of iron mineral. The chemical process in the last century removed the iron from the sandstone which is why the processed sand in the area of the old sand hills is much whiter than sand elsewhere. 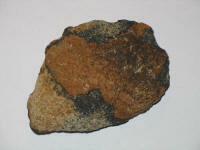 See the asbolite picture above, the red-brown area is iron-rich. This item lists only a few of the minerals at the Edge. Elements found include silicon, copper, iron, lead, sulphur, chlorine, phosphorous, carbon, oxygen, hydrogen, calcium, aluminium, molybdenum, vanadium, tungsten, zinc, barium, cobalt, arsenic, nickel, manganese and even traces of gold.